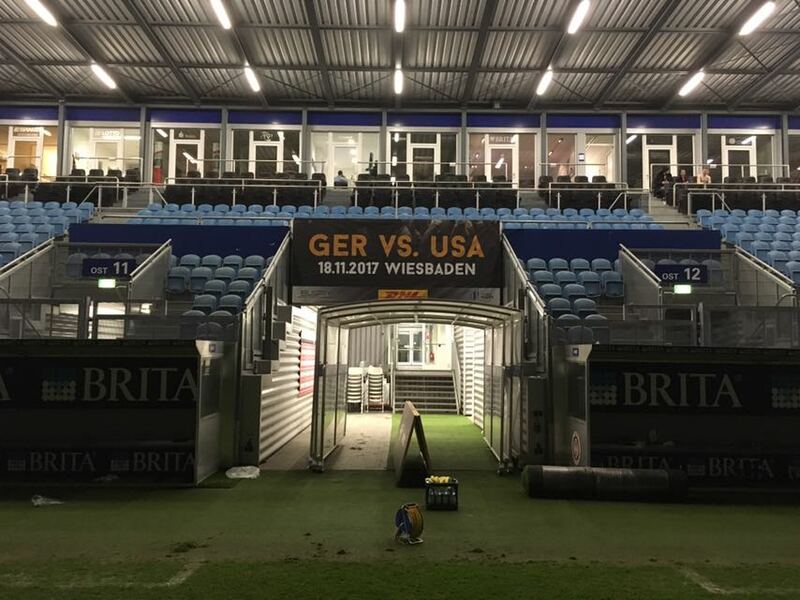 Three tries in ten minutes on either side of halftime was enough for the Eagles to overcome a sluggish start and beat Germany 46-17 in their first match of their November series. A comfortable win over Germany was expected given the levels of experience and talent between the two teams but Germany made the Eagles work for the victory. Now the U.S. will have to turn their attention to facing Georgia next week in Tbilisi. That match is going to take everything the Eagles had with Georgia narrowly losing to Wales today. As mentioned the Eagles looked sluggish early. The team didn't get a lot of time together in camp before today's match and they also didn't play last week. As a result their timing was off as passes didn't hit their mark and they looked lost trying to find their shape. Still, the U.S. did have the first chance of the match but AJ MacGinty's penalty missed the mark. Despite that miss MacGinty had a fantastic game overall. The first try of the match went to Germany. Shaun Davies misplayed the ball near his own try line and was smashed by a German defender as a result. That caused the ball to pop loose and for No. 8 Ayron Schramm to go over for the try. With the conversion Germany led 7-0 after a dozen minutes. It wasn't the finest moment for Davies but he made up for it the rest of the day with a fantastic match. Even with Germany getting on the board and the U.S. looking sluggish the U.S. still had the majority of the good possession. They were soon rewarded with a MacGinty penalty to get on the board. It wasn't perfect with the Eagles spilling the ball multiple times and Germany adding a penalty of their own but they eventually got a second penalty with 26 minutes gone to make it 10-6. The match turned near the stroke of halftime. Finally capitalizing on their good play in the second part of the half Blaine Scully was the beneficiary of hard work from the forwards to dot down. The conversion was good and the Eagles led 13-10 at halftime. That try wouldn't have happened without the hard work of Ben Landry who made a great kick chase, solid tackle, and forced the turnover. On the other side the half the U.S. wasted no time in scoring when big Joe Taufete'e pounced on a ball that Davies had tried to stretch to the line. Moments later it was Davies following up on Taufete'e and suddenly the Eagles were well in charge at 27-10. From there the superior fitness of the Eagles won out. Things slowed down for the next ten minutes as Germany tried to work their way into the match but were for the most part unsuccessful. Instead it was the Eagles that continued to pile on the pressure. They were soon rewarded when Ryan Matyas out-hustled his German counterpart to grab a perfected weighted kick from AJ MacGinty to push the lead to 32-10. A couple of minutes later it was MacGinty that would be able to slip through the defense for the score. With 15 minutes left the Eagles were cruising 39-10. Germany did manage to get another try on the board with Wynston Cameron-Dow scoring. However, that was later cancelled out with Peter Malcolm scoring from a maul in the corner at full-time. Several players had strong performances on the day. Dino Waldren was effective up front. Greg Peterson and Nick Civetta were strong on set pieces. Marcel Brache probably looked the most comfortable he's been since joining the team. MacGinty, Davies, Andrew Durutalo, and Blaine Scully were all strong. Overall, the Eagles have to be pleased with the effort. They overcame the adversity in the first half and turned it into a lopsided score in the second half. It wasn't perfect and if the Eagles have a repeat performance of the first half against Georgia they are going to find themselves in a lot of pain. However, if they can find the space they had in the second half--a tough thing to do against a professional Georgia team that won't tire like Germany did--then they should have success. Either way, without much time under their belts before the match the Eagles have at least had a run out before their tour finale.